Anglers will enjoy two large fish boxes to store their catch. There are two large live wells colored blue inside with LED lighting, one is in the deck near the tackle station and the other live well is in the transom. There is a convenient side dive door for easy boarding on the starboard side. There is ample storage throughout the boat for both your dry goods or anything else you may need. The large console boasts enough space to get out of the weather and ahead. Here is your chance to purchase the 2017 demo boat for $100,000 off of cost! 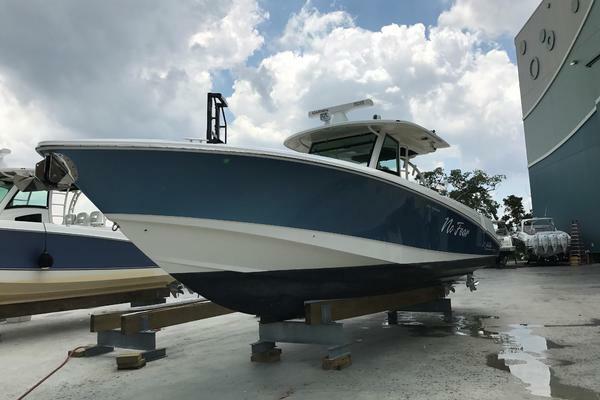 West Florida Yachts would love to guide you through a personal showing of this 40' 7oceans 40FS7 2017. This yacht for sale is located in St. Petersburg, Florida and priced at $345,900. For a showing please contact us by filling out the form on this page and we will get back to you shortly! Full inner liner forward in up anchor locker, a forward storage box and bilge area. A signature cored fiberglass hard top and fiberglass dive door with a custom ladder on the transom. All hardware is stainless steel and all wiring is marine copper tined. An Ameritrail custom trailer will also be available for separate purchase.